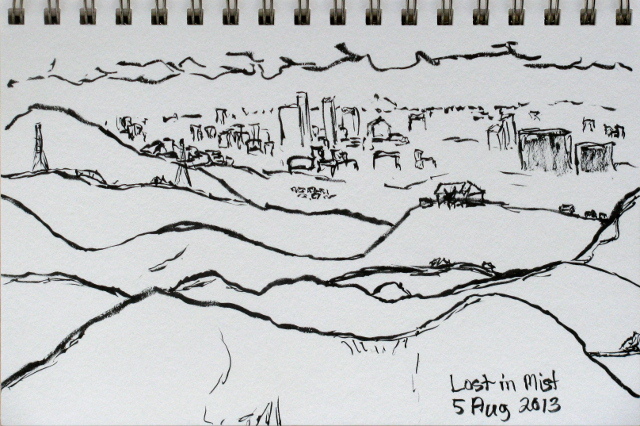 I took a hike around a trail I could see on satellite, but couldn't find information about on my way to LAX. 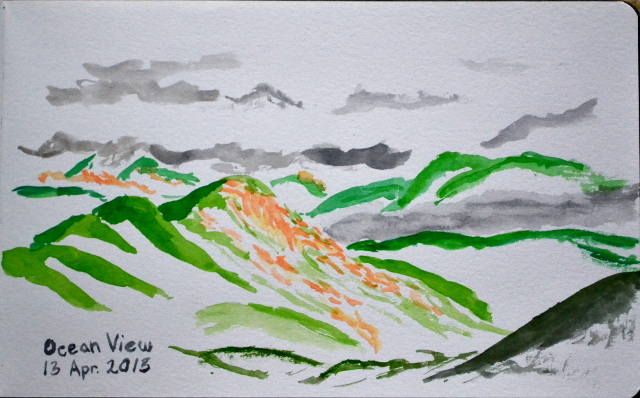 A sketch from Divide Peak after accidentally climbing the highest peak in the Santa Ynez Mountains. I had an exercise in pure randomness. A moment sitting out of the wind at the top of Sawmill Mountain. After Sawmill Mountain, of course I had to go for Grouse Mountain. 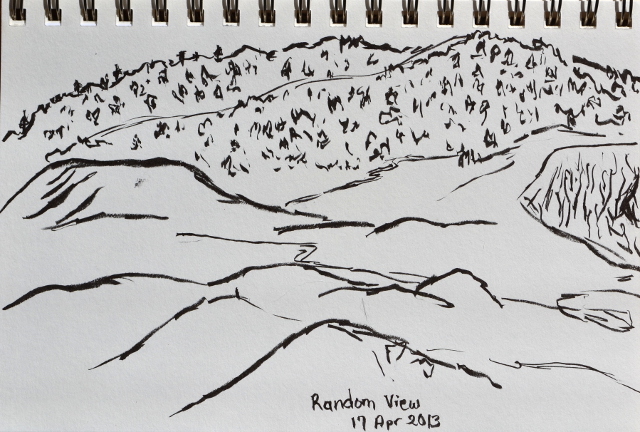 On the way back, I sketched on Mt. 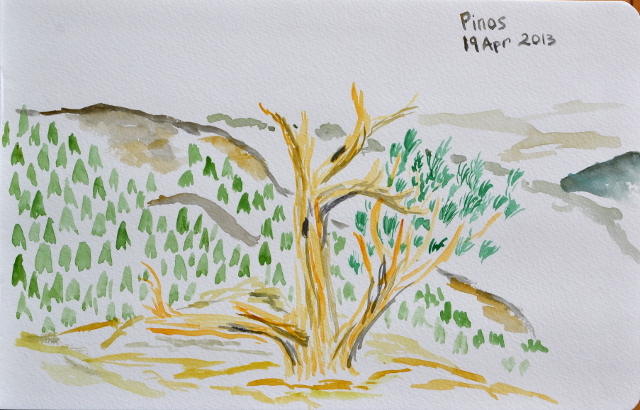 Pinos as well. I made my way up Fish Canyon, the least remote part of a tough area in the Angeles. This hike begins on the other end of the Warm Springs Fish Canyon road I used for access to Warm Springs Mountain. Like on that side, this road is in good shape. Also like on that side, the trails nearby have vanished into the brush for decades without any sort of maintenance at all. Meanwhile, although it is easier to get to than many more crowded areas of the forest, it is thought of as remote. I expect this is changing, especially on this side where many of the trails are in the bottom of a tight canyon and could never have been very good, but also never very hard for route finding. The forces that wash away the trail will also wash out the plants. Also, when I parked by the side of the road at the locked gate, I parked behind another car and there was a group (of likely Boy Scouts) hanging onto it, waiting for their rides at the end of backpacking. I packed up, including some shoes for sloshing through water, and started down the closed section of the Templin Highway. Winding down two lanes with wide shoulders, there is a glimpse of Castaic Lake to the south. 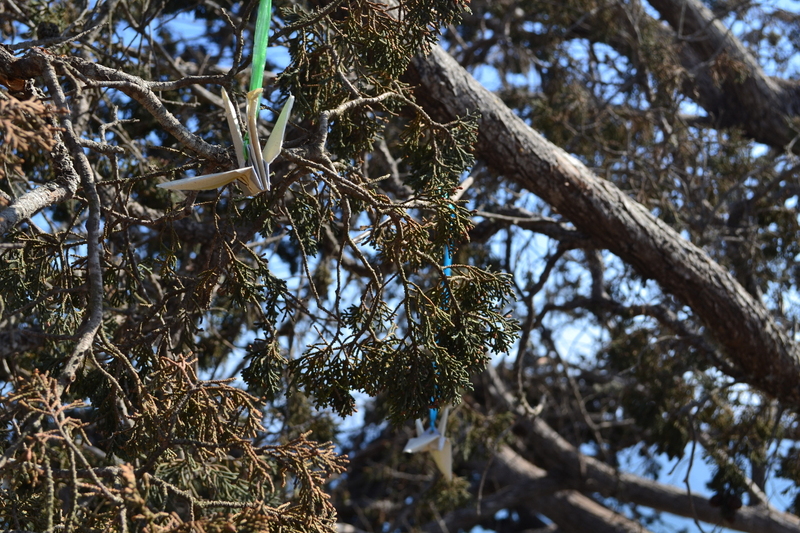 There are stands of pine that look planted and a random palm tree in the flats below the road. It is lined with No Trespassing signs, some next to where there should be a trail. Just past a spot where a bit over half the road has fallen, it ends in a single lane bridge. 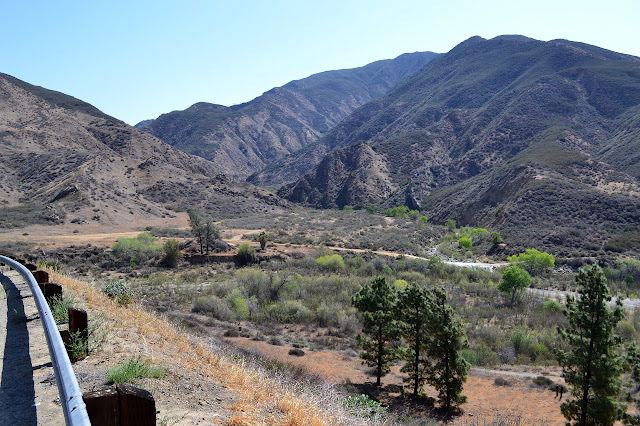 A gauging station sits just north of the bridge measuring the flow of a very dry Castaic Creek. On the far side of the bridge, a bit of old road goes past the gauging station and should continue far up Castaic Creek in a form now reduced to trail. (Oddly, the Liebre Mountain quad takes some of this trail's route from the old telephone line path instead of the road.) The satellite looks promising for that and there could be some fun adventures up that way, but not today. 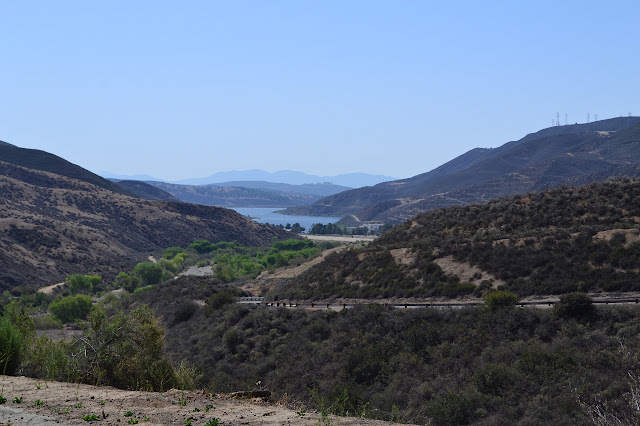 Following the paving down allows a look at Castaic Lake before it becomes hidden by the rest of the landscape. 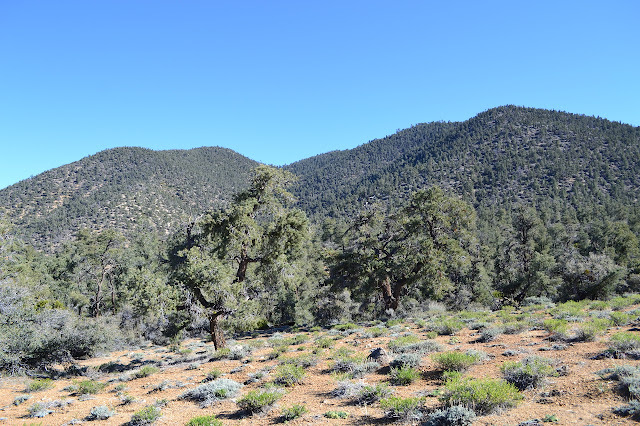 The mouth of Fish Canyon out across the flats with their pines all the same height and lone palm tree. 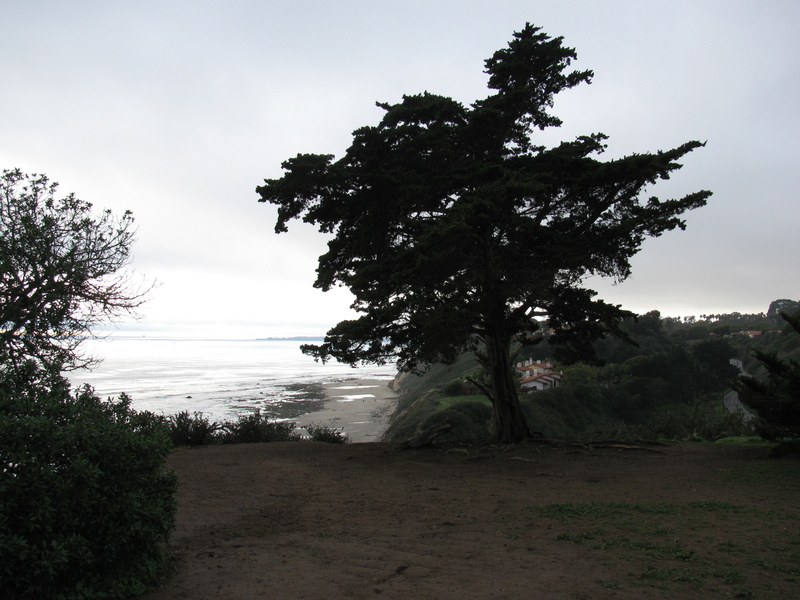 Cypress Point on 30 Dec 2009. It was foggy. 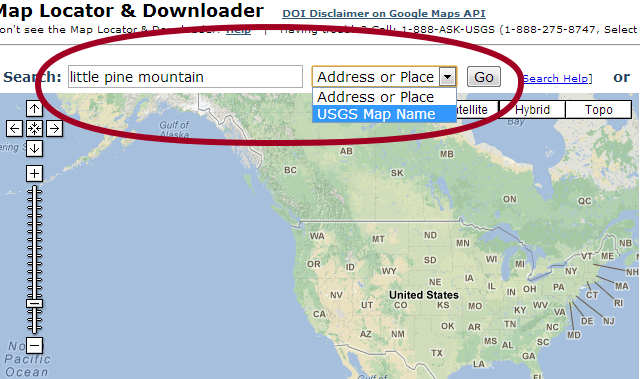 The United States Geological Survey has been making their maps available to download for free from their store website for a number of years. Over the last year, they have been making many of their historical maps available as well. This is done from the map locator and downloader linked on the store page. 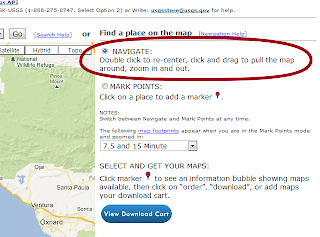 To download a map from that page, you will need to place a mark on the Google map displayed, then click on the mark. This will give download links for each map available for that location from 7.5 minute squares to 1x2 degree monsters. This process could be more straight forward. Here is how to do it. With the "navigate" radio button selected (the default when starting), move the map to the area you are interested in and zoom into the area until the zoom level is at least halfway to the highest zoom. 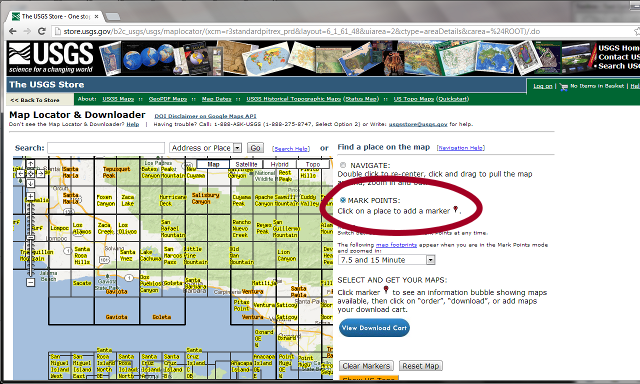 Once in the desired location, click on the "mark points" radio button. Now boxes will appear on the map. These mark the edges of the quads and usually have the name of the quad inside. If they do not appear, zoom in closer. 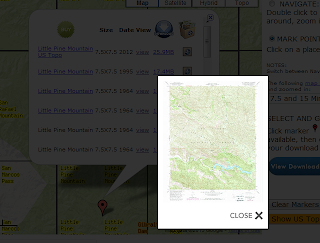 Now click on the map in the desired area and a mark will appear. The page will reload to do this. You can search for a place name or the quad name. The pulldown menu selects which of these your search is. Some quad names are repeated in many states, so adding the state may be required. 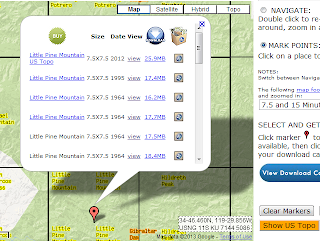 Press the "go" button and the map will move to the desired location, zoom in, and place a mark. Once the mark is on the map, click on it. 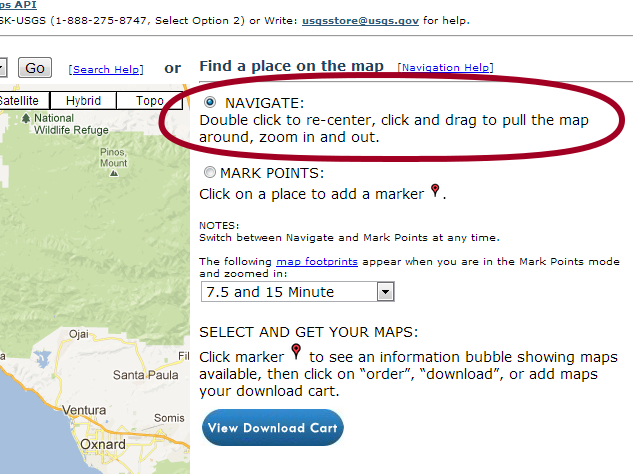 This will pop up a bubble with download links for the available maps for that location. There may be many maps that appear to be the same map. Some of them will be, but some will have been revised with purple at later dates. 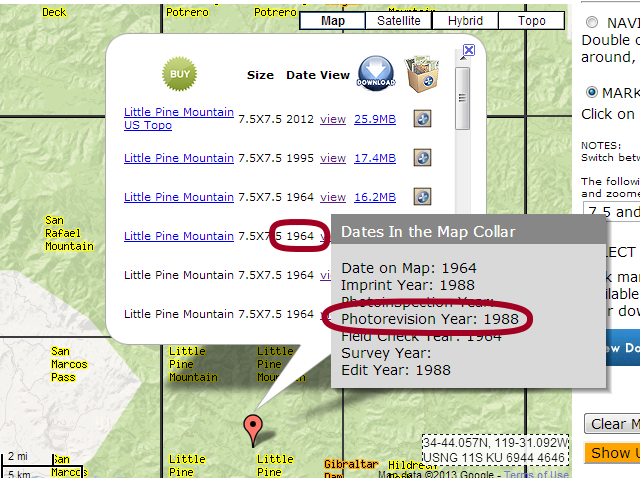 To find out about a map, hover the mouse over the date and more information will pop up. Generally, the most interesting bit of information is the photorevision date. Clicking on the view link will bring up a thumbnail image of the map. This usually works quickly for the first one or two, but can take quite some time after that for me. Once a map has been selected to download, click the link under the "download" image that displays the file size of the map. 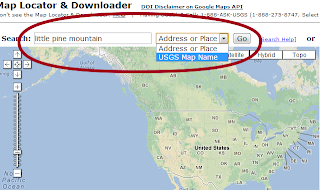 The downloaded maps are in PDF format and are stored inside zip files. You therefore have all the options for printing these that you have with PDFs. If you want it at 8.5x11", you can print it using a shrink to fit option onto a piece of letter paper. If you want a piece of it printed at actual size, then the current view may be printed. 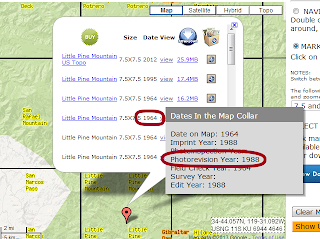 Edit: USGS topos only have a very limited legend printed onto the map. To better understand all the information hidden in the marks of various colors, it is useful to download the full version, which can be found in the publications section of the website by searching for "topographic symbols", or by clicking here if it hasn't moved. I woke up well rested on day three. The night was colder than expected from the daytime temperatures, but still much warmer than the night before. Nothing was frozen. I got breakfast and broke camp and almost got out at a reasonable hour. It was feeling a little warm already once I got walking. The bit of trail I missed because I got interested in something off trail turned out to contain a sign with a better idea of how far this trail is, but some funny ideas further on. As with so many other trails, this one was also once a road. The names have changed to honor the interesting, but here are some destinations. It is 4 miles to Mt. Able Trail (with a road designation 9N25? 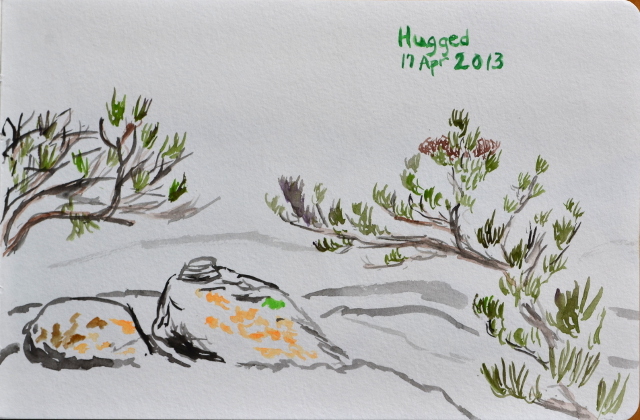 ), 6 miles to Sheep Camp, and 7 miles (a bit shorter than actual) to Mt. Pinos. As I traveled the trail back up, its route seemed even crazier. It was reassuring to see my own footprints coming down it so I knew I was on something that would connect with the right canyon and climb. 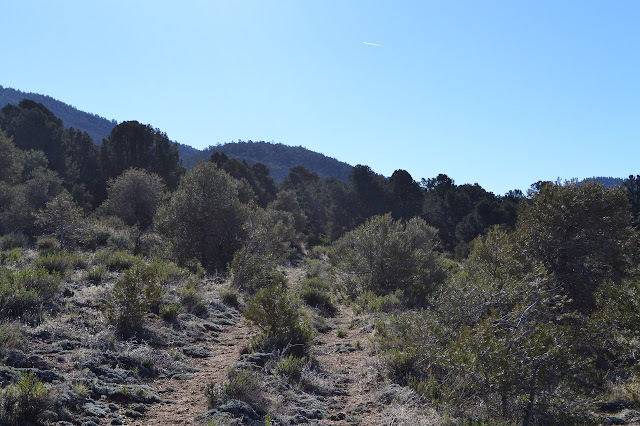 The trail travels near the edge of the sloping mesa. Behind this bit is Cerro Noroeste (Mt. Abel). Ah, day two. I woke up on Sawmill Mountain, still warm under my quilt. One water bag was fairly exposed, having been tossed onto the ground cloth at my feet. I gave it a kick and it resisted, but eventually yielded. Much of the water in it had frozen overnight. The one by my head, sheltered by my tarp wind break, seemed fine and there were water drops on the inside of the tarp. I wasn't feeling hungry or hurried or anything to get me up and out into the cold. The sun came up and I got some direct sunlight for a while. Eventually, I reached out and touched one of those water droplets. It was frozen in place, even after sitting on dark brown in direct sunlight. I touched the water bag near my head, it had significant ice in it. I was thankful I'd cleared the tube of water before going to bed, it would have been frozen solid now. When I did get up and get started with breakfast, I found that the water in the pot now had over an inch thick ice on the top. A little extra fuel and it was bubbling warm anyway. I packed up camp and headed down the mountain. The camera didn't care that it was warmer now and was still refusing to unlock the shutter. I followed the trail down the west side of Sawmill. At the junction with 22W02, I decided to see the springs and, since it was on the way, Sheep Camp. None of it is very far down the trail. The first spring is a trickle flowing across the trail. Water flowed under a half inch layer of ice to meander down the mountain. Higher up, small pools were open, but they weren't really big enough to pump from. Next, I came upon Sheep Camp. It is a large open space around a huge fire pit and grill that looks like it gets a lot of use. Past it is a second grill. A few steps further, and I found one more grill by the spring. The spring is hard to miss as the trail steps directly over the pool it has been piped to. The flow from the pipe was just big drops, not as much as the higher spring. The only ice was on some leaves between the pipe and the pool. What a difference a few feet make. Above, an old sign seemed to have been repurposed to covering over the actual spring. I poked around the camps an little and found someone has attached plastic sheets to the secondary grills with electrical ties. I have no idea why that would be. 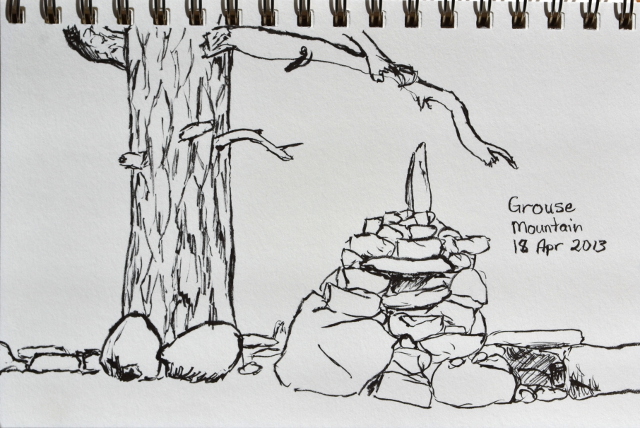 I returned to the top and continued on to Grouse. If you can't find chill next door, just go higher. Out to really test my new gear, I headed for Sawmill Mountain, elevation 8820. The predicted low (as of Monday) for Frazier Park on Wednesday, elevation 4640, was 34°F. What does that mean for up by the top of Sawmill Mountain? Something nasty, very probably, but this thing should go to zero, at least with reasonable clothing added in, and I can always bail. There's been a bit of wind blowing, so I made sure I could put up a wind break as a bit of caution, otherwise it's all up to the 6 oz. Climashield Apex with extra insulation in strategic locations. Well, also this silly insulated inflatable thing I've picked up and am a little bit worried about. Sure it says it's nearly twice as insulating as the old basic blue, but it could be lying. I made my way up Mt. 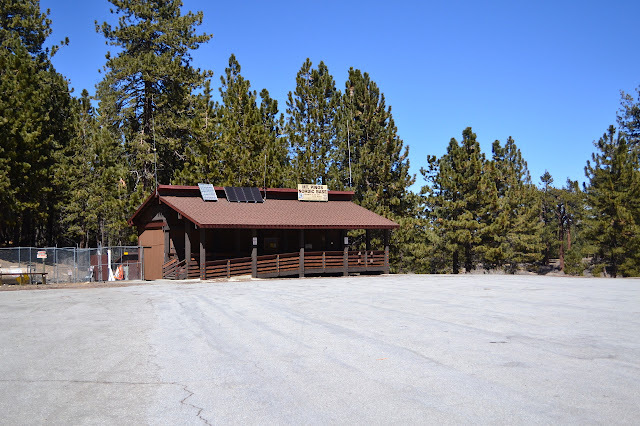 Pinos and found a spot in the vast and empty lot at the top, elevation already 8300, and transferred things like the first aid bag from day hiking to backpacking gear. Tossing it all on my back, I started up the old road toward the peak. Park anywhere, except near one of the assortment of no parking signs. The "Nordic Base" sign claims 8300 feet. It's two miles to everything? Really? 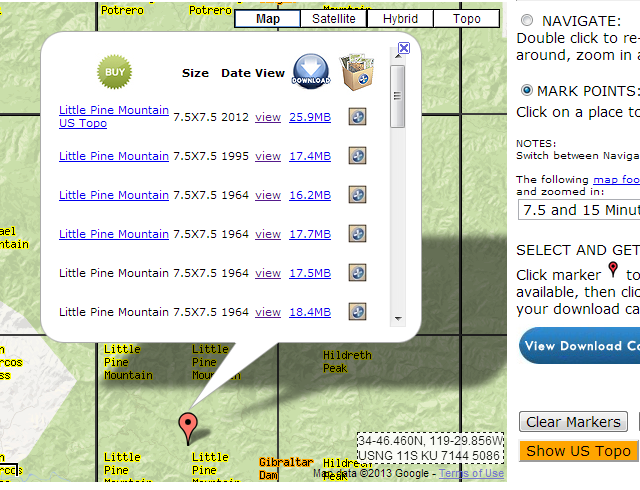 Well, the summit and the trail head are about the same distance away, but North Fork is nowhere near there. And it's 22W02. This is an entirely random little hike. Some time ago, while taking an initially foolish but ultimately very nice hike, I nearly tripped over a benchmark labeled "Random No. 2". Although it does hint at there being at least one more random benchmark, I was willing to leave it at that. I even thought I'd seen it on a map somewhere, although I'd misremembered which. Then Craig R. Carey decided to help me out with that. Random No. 1 doesn't look that hard to get to, but even this wasn't enough to actually go looking for it. However, in a few more steps I almost tripped over a second survey marker, this one for the Los Angeles and Ventura County border. The small "entering Los Angeles County" sign next to it hinted that Los Angeles County surveyors probably set it. The Random No. 2 mark was set by USGS "in cooperation with Los Angeles County". It looks like these two could be related. The Los Angeles and Kern County line runs near Random No. 1 suggesting that there might be another county marker to be found. Since I've run into only one of those, that was more interesting. I decided to go up to Divide Peak partly because so far I have scorned the road that the forest service sends the public down instead of Matilija and partly because I wanted to see what the terrain really looks like about half a mile up from the end of this rather unsatisfactorily aborted attempt at White Ledge where the lines get a bit close together on the map. Sure, White Ledge doesn't haunt my background, I have other bumps to wonder about, but it is sitting there in the middle of everything being virtually unobtainable. The last few days, the marine layer hasn't been bothering to burn off, which tends to lessen the views of the ocean, but I decided to not worry about that. 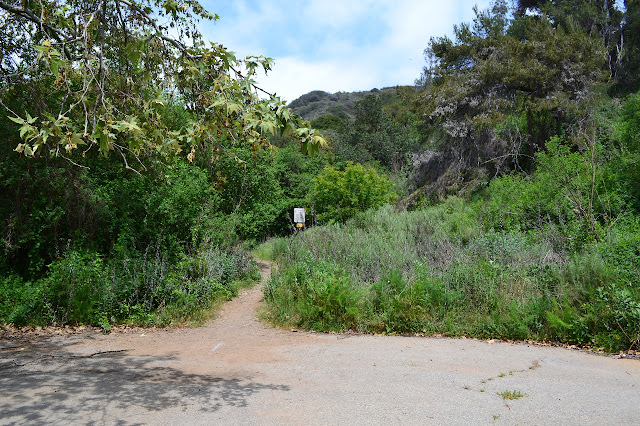 I added my car to those carefully ringing the dry Loch Lot and made my way down the locked road through Matilija Canyon Ranch listening to the squawks of peacocks, an action that now seems casual after the other trips from this trail head. There's a little bit of mist in the air from a small amount of marine layer leaking over the top of the ridge as I start up the canyon. The first creek crossing was just a step from bank to bank and the second seemed to have okay flow as I hopped along the rocks south of the ford. The map on the Upper North Fork Trail sign has pealed into uselessness. I turned off the road after another tenth of a mile to start down Murietta Creek Trail, which may reduce the distance slightly, but definitely reduces the amount of time on the road. It starts off dry, but as it gets near the creek starts offering an assortment of poison oak leaves to rub against but are currently almost entirely avoidable. A little bit of single track trail on this mostly road route up to a peak. The cut of the alternate route is visible to the right. I've been putting together a few bits of gear for various reasons. I'll probably get to saying more about them when they're better tested, but I thought I'd start with the one that I didn't even really think of as some gear: a retention cord for the camera's lens cap. I've dropped a pretty penny on a bit of heavy camera kit and expect that I would lose the lens cap within a week as it comes, so had to do something about it. I found a cap for a Canon in Forbush, so it seems that maybe someone nearby needs a little help. So, get hold of a bit of cord and glue. I've got some from Michael's that comes in a dozen colors plus metallic, but went boring and grabbed black. It's thin, tough, and not at all stretchy. The glue is some E-6000 I picked up in a pinky sized tube for even less. Locate a spot on the side of the lens that is far from buttons and doesn't move and cut a bit of cord to reach from it to a spot on the cap plus an inch or so extra for slack. Dab a bit of the glue on the chosen spot on the lens and stick the cord into it, then add a bit more to cover the frayed edge. Do the same on the other end on the cap and let it all dry. I can just pop the cap and let it hang now. The glue isn't showing any wear from the treatment over a few hikes and an overnight. I've already bumped the lens twice in ways that popped the cap off. I noticed right at the time, so presumably would not have lost the cap. It might take me another month to get to a point where I would have lost the cap were in not connected, but it really makes the cap easier to handle. 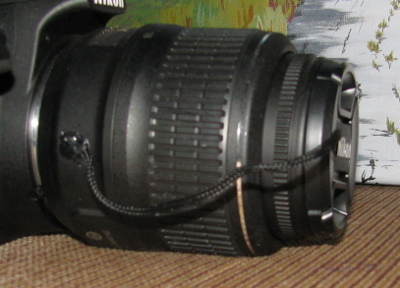 Why doesn't the lens come with the cap tied on? I must be missing something, but I haven't found any drawback yet. I would be in a stone's throw of a bit of trail I had located, but found no information online about. 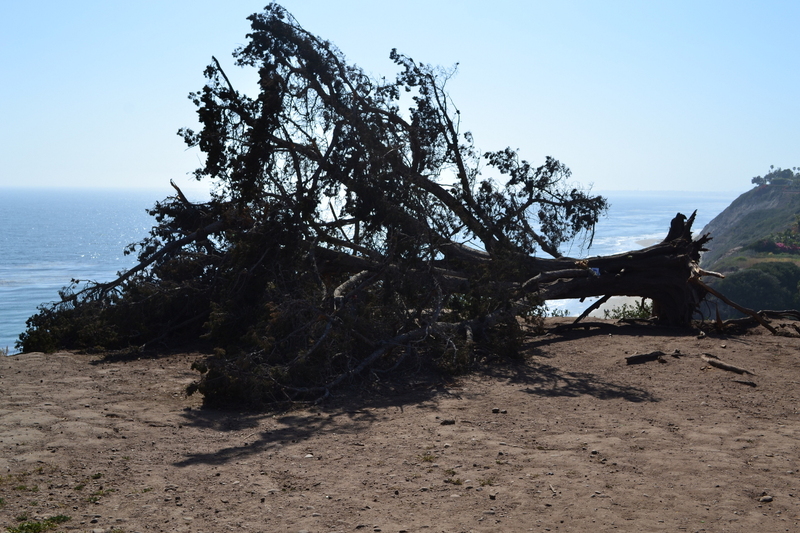 I would have sufficient time to investigate it, so I headed out to Rivas Canyon Park. 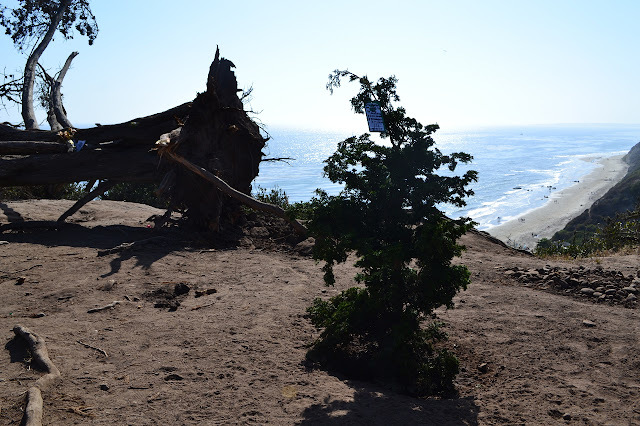 This is a tiny bit of land sandwiched between Temescal Gateway Park and Will Rogers State Historic Park. 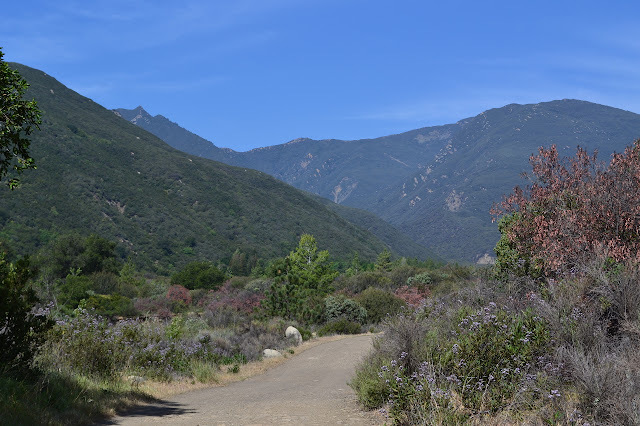 People seem to consider this park simply as a holder for a trail to travel between the other two, but I had found a very distinct looping route around the ridge edges that define the watershed that is Rivas Canyon. In fixating on finding the road and making the left into it safely, I managed to miss that it is private. That and that there is virtually no parking at the end force me to recommend against starting in the same spot. 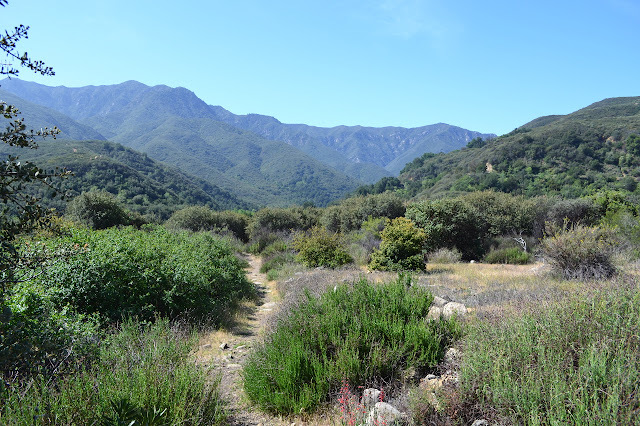 Temescal offers a much superior starting point with plenty of parking, including free space along the roads near the entrance, and bathrooms at the start. Will Rogers is also an excellent starting point. Trail continues when the road ends. The signs here aren't all that informative. 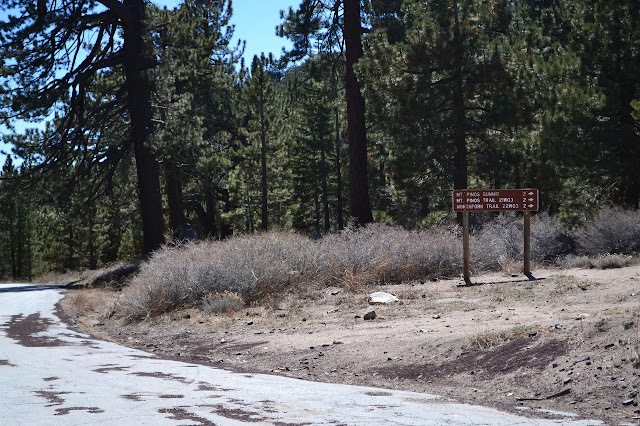 They simply state that you are entering the state park and are required to know the rules. Also, motor vehicles are prohibited. The canyon is lush and green, but has no water flowing down it. 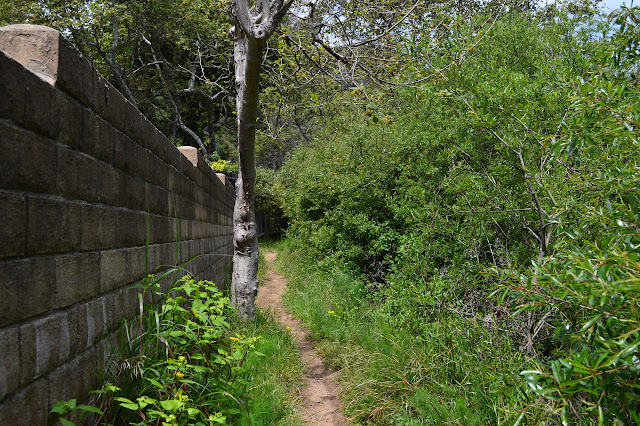 The edge of the trail becomes a wall as it comes near some houses served by roads above. 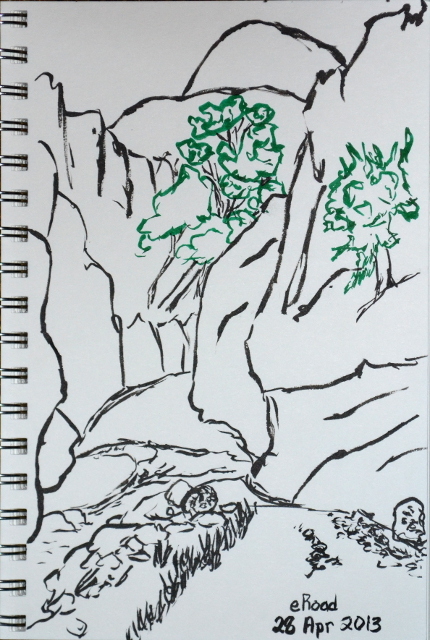 The houses retreat up the hillside quickly and the trail enters a eucalyptus stand, then the hiker is back to being surrounded by lush green. 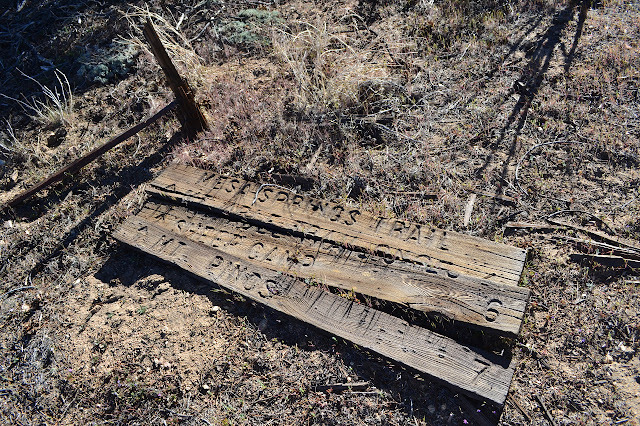 The only thing of man's handiwork that is seen are the tall wooden flood barriers that occasionally cross the canyon until the trail makes a turn to start climbing the side of it. Houses encroach on the left for a bit. 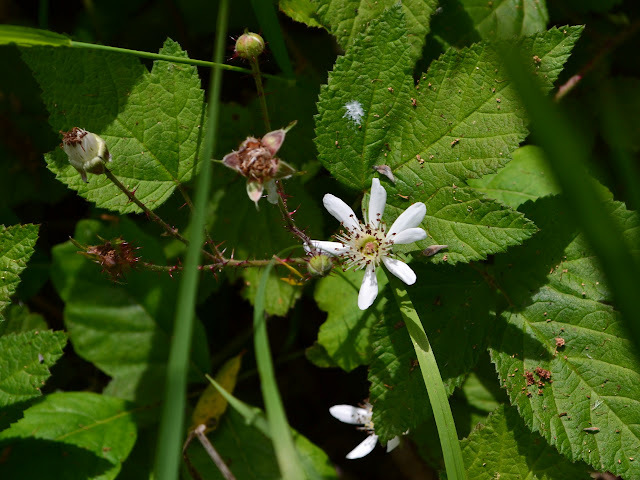 The undergrowth is full of raspberries, as well as a bit of poison oak.